Joist floor slabs can be composed of concrete (generic), precast reinforcement, precast prestressed, in situ, steel (T and double T sections) and truss joists. The deflection is calculated in all cases. Additionally, it allows for flat and solid slabs, waffle slabs, hollow core slabs, and composite slabs (steel deck) to be used. The floor beams may be reinforced concrete, steel (normal or castellated) or mixed. Corbels can also be introduced. The program allows for reinforced concrete, rectangular, circular or steel columns. Shear walls can be rectangular or adopt on plan any shape made up of rectangles. Walls may or may not have lateral pressures and may be reinforced concrete, generic load bearing or concrete block walls with or without reinforcement (the dimensions of the blocks are introduced by the user or from manufacturer catalogues such as NORMABLOC National Association of Concrete Blocks and Masonry Manufacturers). The program calculates the necessary additional reinforcement of the openings in the reinforced concrete walls (lintel, guardrail, lateral and diagonal) and the lintel reinforcement when the gaps are introduced in concrete block walls. Additionally, it is possible to obtain a report of the checks that are carried out in the analysis on this reinforcement and can be viewed on screen or printed out. The crown beam is also designed for all types of walls as is the intermediate beam at floor level in the case of generic load bearing walls and concrete block walls. 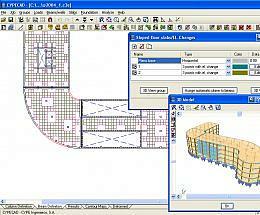 CYPECAD analyses and designs stair slab reinforcements as isolated elements of the structure. Depending on the geometry, type and support arrangement and the applied gravitational loads, the program establishes the reactions on the main structure, which are applied as line and surface loads (in the case of steps built on the slab) in their corresponding permanent and live loadcases. The program calculates the stairs by finite elements, taking into account the usual two loadcases for the stair analysis: permanent loading and live loading. 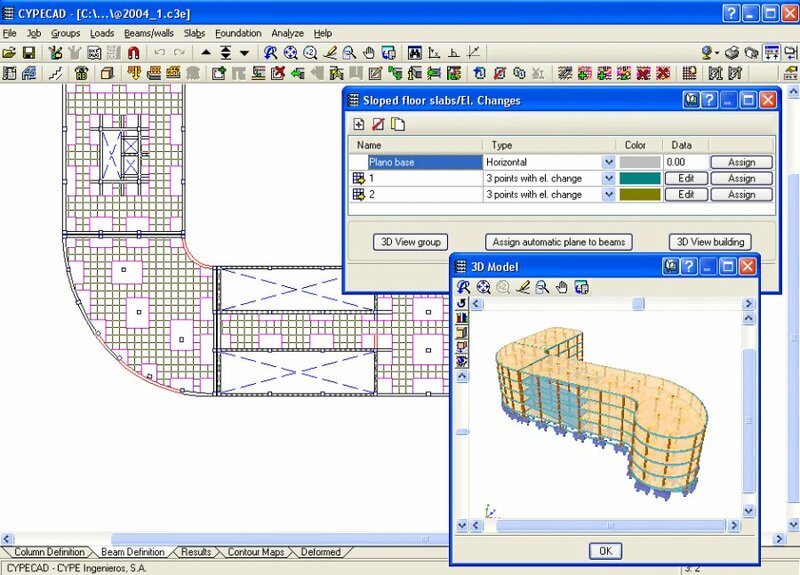 CYPECAD displays on screen the reinforcement of each of the spans making up the stairwell. It is also possible to consult, in a three dimensional view, the displacements, forces and see the deformed shape of each span. The foundation can be fixed (by pad foundations or pile caps) or floating (with slabs on grade and foundation beams, having to define the subgrade modulus upon applying the Winkler theory). The foundations may also be designed by having only introduced column starts. Isolated or combined pad foundations may be composed of reinforced concrete or mass concrete and may support multiple columns. * CypeCAD download link provides trial version of the software for Win 64 and Win 32. Simulate your architecture & building projects in augmented reality on iPad, iPhone and Android. This simple, yet efficient, construction management software is aimed at providing an overall preview of the project progress for top level management. CypeCAD has been rated 5.0 out of 5 points. A total of 1 votes cast and 0 users reviewed the software. Golden Softwares Surfer software is a full-function 3D visualization, contouring and surface modeling package that runs under Microsoft Windows.